Welcome to Troop 525's Website! 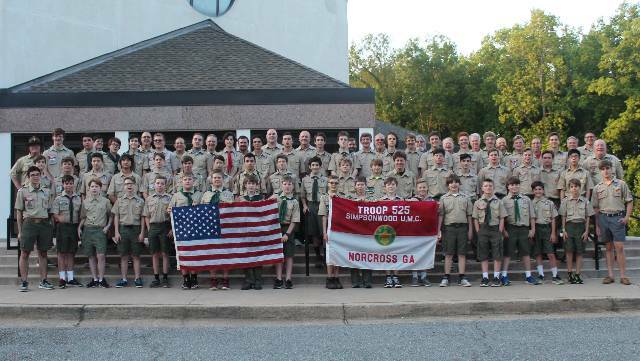 Welcome to the website of Troop 525 in Peachtree Corners, GA! Chartered with eight boys in August 1984 Troop 525 is boy-led and each is required to hold leadership positions as he advances in rank. The troop meets each Monday night, while school is in session, beginning at 7:30 PM at Simpsonwood United Methodist Church (SUMC) 4500 Jones Bridge Circle, Peachtree Corners, GA 30092. This site contains information for the scouts, parents, members and volunteers of our troop. Visitors are always welcome. Come join us! Boys who are older than 10, or who have completed the fifth grade can join the Boy Scouting program. Cub Scouting is for boys in the first through fifth grades, or 7 to 10 years of age. For information about Cub Scouts please contact Pack 525 (pack525cubmaster @ gwinnettbsa dot org). ** NOTE: Troop members - if you have questions about our new website please see 'Website FAQ' or contact our webmaster. You should have received your new username and password via the email you have registered with our troop. Please check your SPAM or Trash folder if this email is not in your inbox. If you have concerns / issues / ideas to improve the site please contact the webmaster (webmaster @ troop525 dot org). Give Lisa Burns three (3) copies of each of the above per person. One goes to camp and two stay in the master file. Please don't email the forms. Ensure they are completely filled out and signed. When thr Crew or Troop checks in they go over every single one and the Troop can't check in until all are validated as complete. FOR SEABASE OR PHILMONT - All Scouts and Adults attending will need current parts A / B / C with a date not more than 365 days prior to the last date of the trip. There is NO flexibility. Without an updated medical form that individual doesn't leave the parking lot with the Troop. Camp will turn them back and not allow them to even check in.